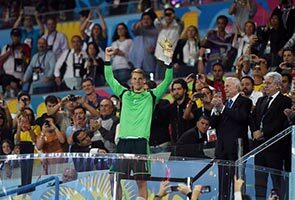 RIO DE JANEIRO: Germany's Manuel Neuer won the World Cup Golden Glove award for the tournament's best goalkeeper after helping his side to a 1-0 victory over Argentina in Sunday's final. The 28-year-old Bayern Munich player was presented with the award at Rio de Janeiro's Maracana Stadium moments after the triumph. He beat off competition from Argentine opposite number Sergio Romero and Keylor Navas of surprise package Costa Rica. Neuer was beaten only four times in the tournament and kept clean sheets in the 1-0 quarter-final win over France and the victory over Argentina in the final. He succeeds Spain's Iker Casillas, who was voted outstanding goalkeeper at the 2010 tournament in South Africa. Malaysian companies to get a touch of German gusto? How does a truck company get more money for you?